1.8 miles walked on Saturday...didn't quite finish the 5k, but I went and did what I could and realized that I probably could have done it, but second guessed myself. The biggest thing is that I tried and I went 1.8 miles..that is huge, I will get it next time. Sundays are always good days...can't go wrong there! Get to hang out with so many people I love! Plus my cousins were in town, fun to hang with them. Monday...well wish I could erase that day...but not going to happen...zero motivation..not a fan of myself, Mondays are always the worse..I need to find a way make that a Great day! Any suggestions? Tuesday...much better...went to Jensen's grove with my Trainer and walked and did a work out while doing that..including push ups, lunges and dips...definitely pushed myself and did more than I thought I could. Nothing feels better than ending the day on a positive note. Red faced, breathing hard I finished it!! Below..my red faced accomplishment!! PS...I absolutely love my trainer...not only does she push me, but she always finds the positive in what I am doing and helps me see that instead of what I do which is focusing on the negative. She has become a great friend and I love her to death. She is one of those people you know was put in your life for a reason!! Love ya Katie.. 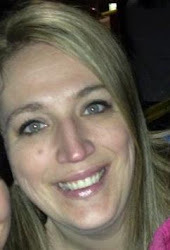 I am not sure if any of you watched Women's Conference (those who aren't LDS, it is a conference just for women in the church) on Saturday, well it Rocked and I have found myself really motivated...I am praying for it to last. So...this is going to be a good work out week!! Monday 530am...I hit the gym with my cousin Erin P. Holy tar that is early, but I got through it. Tuesday went to the gym to do cardio before I met with my trainer to do arms and core. 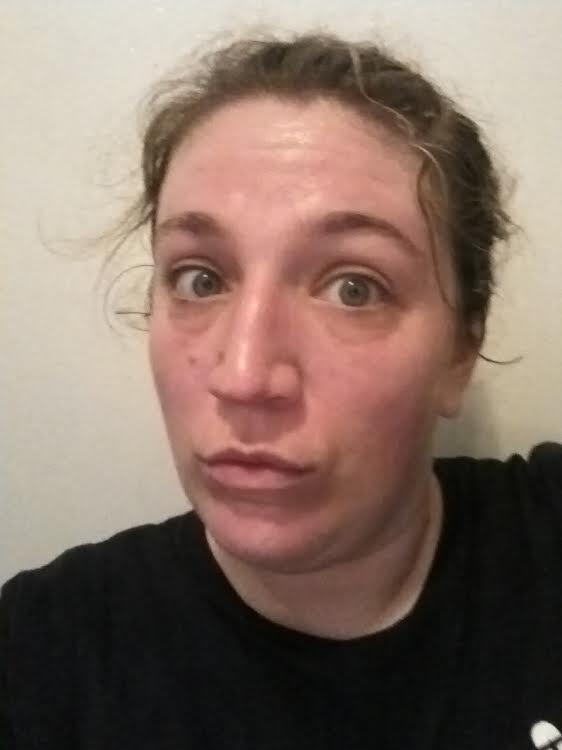 Holy crap that was an intense work out, I was sweating like a beast and Red..like always...Pictured below is my I am going to die face with a little bit of my lips puckering. 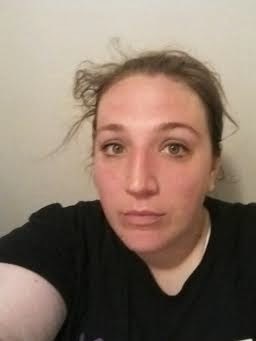 There is no way to get a good pic after working out. I am heading to Utah...Good thing my gym is down the road from my sisters and I am sure I can convince some cute nephews and a niece to walk with me. Have fun working out this week, I know I will!! 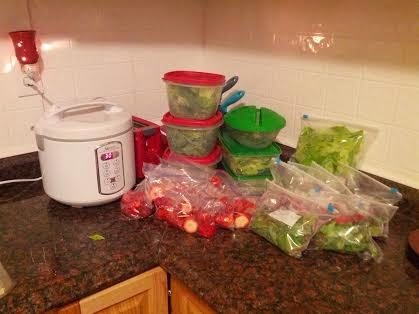 My struggle with food continues, but I do much better when I have everything ready for the week. So everything is ready to go!! I even steamed chicken and hard boiled eggs. Besides sushi night with the girls this week...I will be eating healthy!! I already feel a sense of accomplishment just getting the prep done. I know I am a big dork...but whatever works right!! A year in review...and a little Hope! This last year has been one of the most trying and difficult years of my life. I am not where I thought I would be at this point in my life. I know that I need to better myself in so many ways. Now did I lose all the weight I wanted to, no, probably gained some. But my year was not solely focused on weight loss, in order for me to lose the weight I need to make other changes in my life. I spent a good part of the year focusing on letting things go, especially things I have no control over and have been hanging on to them for years. Also not dwelling on the bad and letting it affect me for months at a time. Realizing I am not perfect and if I have a bad day, or something doesn't go as planned, there is always tomorrow to start over and I do not need to bring it over into the next day. This was huge for me, I am not perfect at it, but I have learned how to let things go. I have in the past tended to dwell on things that are not that important and it affects my life in such a negative way. I am learning and am much better at focusing on the positive things in my life. Such as a family who loves me for me...craziness and all. Also for a Father in Heaven who knows me..where I need to be and who needs to be in my life. I have been so blessed to be in Blackfoot, ID (who would have thought I would ever say that, lol) and for the friends I have made here and how welcoming they are and how much love they have shown me! We all need to be loved right? Most importantly we all need to love ourselves...something I struggle with and something I am working on every day. Goal #1 for 2014: Believing that I deserve better and I am better...Most importantly loving myself!!! A little bit of Hope.... In August of this last year I started school again after a very long time. School is hard for me and it always has been. I took Anthropology and a literature class. I really liked both of them. Literature I ended up getting a B+, which I was stoked about. My professor, who I liked very much, was hard to figure out and I struggled knowing exactly what she wanted. Did really well on the papers, but struggled somewhat on the tests. But I left that class with a better appreciation of poetry, drama, fiction and non fiction stories. Anthropology was a bit harder than the literature class, but the professor was amazing, I couldn't wait to go to the class each week and it was a 2 1/2 hour class. This wasn't a sit and listen to the professor type class, I had to be involved, working in groups, class discussion. I made a goal to make a comment each week, which I did, so I had to know my stuff. His tests were hard. On the first test 78% (devastated, wanted to throw in towel), 2nd test 84% (feeling a little better), 10 page paper 96%, and finally the final....(sorry this is long) This is where a little hope comes into play...I studied really hard for this final, I knew if I could get an A depending on the percentage I would get an A or A- in the class. I had some extra credit to make up for my other tests that weren't at the highest. The final comes...I take my time taking going over each question at least 5 times and making sure all my answers matched up with the right number. I left feeling ok...positive that I more than likely will get a B,B+ in the class and I was ok with that. I knew that I had done everything I could. I am at work and every day, every hour more like it I check to see if they grades are posted....Well....I refresh for the 100th time that day and guess what pops up 100%...and sat there shocked and refreshed it a few more times...then it hit me...I did it...I got an A....Then I sat and cried in my office like a baby!! In that moment for the rest of the day was this overwhelming feeling of hope and that I really can do anything, a little hard work and massive amounts of prayer and major things can happen. It has been a long time since I felt such true happiness and joy. I don't ever want to forget that feeling, which is why I am writing this and maybe by sharing this this can help someone realize that they can do it to. Because since that moment and coming into a new year I have had those moments of doubt and insecurity...I remember that 100% and that I can do this. I know that there will be struggles, but getting through those struggles can only make me stronger. So it is Monday and my Literature class it tonight. I get real nervous when I go to this class because right now it is all about poetry. I struggle with that and interpreting it....Ugh!!! Well we are learning how to compare a picture to the poem written about it. She says we are going to each be assigned one and we are going to study it and present it to the class. At this point I think I went completely pale and was trying to figure out which door was closest for my quick exit. So I of course said a quick prayer...and pretty soon I started to calm down, my fists weren't quenched so tight anymore...needless to say I did survive and didn't pass out. I think I did a pretty good job!! Sigh of Relief.....Next week my first test in this class.....let the next panic attack happen. The Picture Below and the two poems are what I had to present to the class...It is actually very interesting. So what do you all think???? 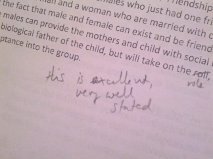 Went to my first week of my Literature class, one that I was dreading and struggling with all the reading. I did make it to the class, even though I kept telling myself I couldn't do it. The class wasn't bad at all!! My professor is an older woman who is so eccentric. She gets so excited about poetry and laughs at her own jokes! Poetry is not my thing, but I think I will survive this class. It is definitely going to be hard for me, but it will be a good challenge. 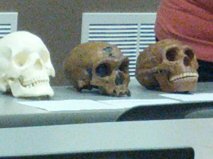 Who would have thought that my Anthropology class would be so interesting and I am so into it! Crazy right!! 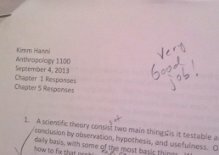 I have a pretty good professor so that helps. I got my first assignment back and I did a pretty good job, such a sigh of relief...I may survive. I look forward to going to class each week. My first tests are coming up....My oh My...Let the anxiety begin. The Rendezvous Building where both of my classes are in the same class room! 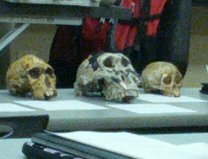 The skulls we are studying right now. I didn't get pictures of the Gorilla's..they were pretty cool!! My First Assignment...I got a Very Good Job!! I will take it!! So I have decided to go back to school...Someone help me! It was a last minute decision and everything just fell into place. I got into Idaho State University, got my student loans, and books. Attended my first class the end August﻿, was very nervous, circled the building a couple times while talking myself out of going, then talking myself into going. I parked in the farthest parking lot away so I could get some exercise walking to class. I felt a little old walking by the dorms....hoped I wasn't the oldest one in the class. Anthropology my first class...wasn't the oldest one in the class, but was definitely afraid to talk to anyone, kept to myself and listened intently. I haven't yet been to my Literature class, I missed the first day due applying so late. I have struggled with the reading so far which has been super discouraging. 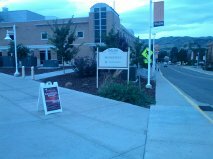 I will attend my first class there tomorrow 9/9...I am extremely nervous and feel that I am not very will prepared. I have done my best to get through the 200 pages of reading...ugh....I keep telling myself to drop the class, but I don't want too...I need to finish school. I need to do something that will make me happy. Instead of bouncing from one job to the next. I want to be a teacher, I always have wanted that, but I hate school...Ironic...I think so. The 2nd day in my Anthropology class...I made a goal to participate and talk to someone. I felt prepared. I read everything I was suppose to read, some of it twice. I did the homework...with only a few tears. I think it will get better each week. I was nervous all class...then he asked a question...I knew the answer...so I raised my hand. He called on me in a very nervous voice I answered...He said excellent. Oh my goodness I just got a gold star. That is how it felt! I took a deep breath and the nerves went away. Then we had small group discussions..started to freak out a bit. Didn't leave after the break...another gold star. I was so glad when the guy in front of me asked me to be in their group. YES!! I met 3 people in my class. One who's name is Stacey and she is awesome! My first friend at college. Such a nerd... I was able to accomplish both goals: Participate and Make a friend! I feel like a complete dork, having to set goals for myself and having a constant battle with myself to do homework, stay in school and not drop out, not feeling smart enough. Has anyone gone back to school after a long time and felt like this or am I the only one. I have to do this, I know there will be good days and bad. I need to do something with my life, these dead end jobs are killing me. Am I thankful I have a job. Heavens to Betsy yes....but I want to do something that I have always wanted to do...So back to school I go.